Future Concrete makes concrete kitchen benchtops, splash backs, bathroom vanity tops, concrete sinks, showers, bath surrounds, fireplaces, tables, desks, chairs and more. 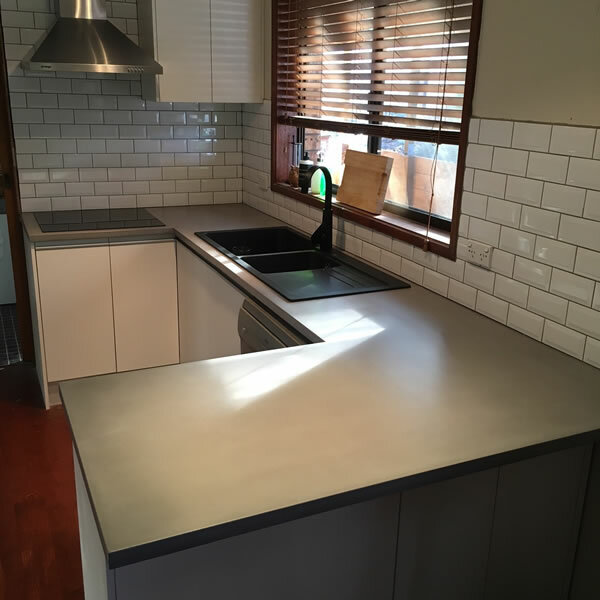 Concrete benchtops can be straight, curved, notched, multi-level, etc. Unlike granite and quartz, which would drastically increase in cost for curved shapes, creating curved concrete shapes simply involves some extra complexity and labor in forming. Concrete floors are a different application. Future Concrete can recommend companies who specialize in various types of concrete floors. Who would want concrete benchtops? If so, concrete benchtops may be right for you. What are the advantages and disadvantages of concrete compared to other benchtop materials? Custom: Concrete’s biggest advantage is that it is completely custom. Your benchtop will be unique to you and highly personalized. Practical: Future Concrete uses a sealer that is extremely stain-resistant and low-maintenance. Common food items will not stain it when wiped up quickly. The sealer does not degrade, and therefore does not need to be reapplied every year like many other sealers. The sealer also exhibits great heat resistance. Imperfections: We believe that this is an advantage. Concrete benchtops are hand made and hand finished. Since concrete is a heterogeneous mixture of many different ingredients, subtle variations in colour, shade, texture and overall appearance should be expected. All concrete is susceptible to harmless hairline cracks. They will sometimes appear months or years after installation, and are generally a result of seasonal movement of the cabinets and the house itself. These should be considered part of the aesthetic charm of concrete, and not a defect. Concrete exhibits natural beauty rather than plastic perfection. Staining: Concrete benchtops actually behave similar to granite in this regard. Granite benchtops are also porous and have to be sealed and maintained. Most people don’t realize this, because granite is usually too dark and patterned to show stains. Food, acids and oil will not stain your countertop if wiped up immediately, and if left on for a longer period of time, they will cause only a light spot whose appearance can be minimized with a touch-up kit. Scratching: While the sealer is very durable, it is possible to scratch it. For example, in kitchens, you should use cutting boards and not cut directly on your benchtops. Lead time: Because concrete benchtops are completely hand made from scratch for each client, they take longer than sheet goods that are simply cut by a machine. See the section on lead time for more details. Even though it is a completely custom material, concrete is competitive in price with standard benchtop materials. The price is competitive with high end granite, generally around $1200 per square meter. We are happy to work with you and your designer to give you an estimate on your project, and we can help you with options to fit your budget. Any colour! Concrete can be made in hundreds of colours including every colour on the spectrum. Any colour can be produced in a solid, speckled or variegated pattern. And, you can specify embedded stone, glass, or other objects. You can specify the colour, size and density of embedments. Coupled with the many colour choices, you have myriad design options. What is the process for custom colours? Future Concrete specializes in custom colour development. We can customize existing colours or match the colour of an item such as a paint chip or fabric. The process takes about 3 weeks. We produce two or more 150x150mm samples and submit them for your approval. How much colour variation can occur? Concrete is a natural, handmade material. Many factors such as humidity, sand lot and cement lot can affect the final appearance of the concrete. All of our colour formulas record the type of sand, type of cement, and exact measurements of pigments to 1/10th of a gram, and we use specially developed software to calculate mix design. However, colours can still vary because of the aforementioned factors. Another factor that contributes to perceived variation is simply the size of samples. A 150x150mm sample will look different than a whole benchtop simply because the small sample does not capture all of the natural, random variations that will occur over a large surface. The colour in a 150x150mm sample may appear completely uniform, but a whole benchtop in that exact same colour will not appear as uniform. The same situation occurs with other natural materials such as granite. If you are looking for perfect uniformity, you might not be right for concrete, and you should choose solid surface instead. For concrete, edging is formed and cast rather than cut like granite or solid surface. Therefore, edge choices depend on the availability of appropriate trim moulding. For example, Future Concrete can do pencil, beveled, concave, bullnose and reverse cove edging, and other custom edges may be available. Edging may be placed on top or bottom of the countertop. What kind of sinks can be used with concrete benchtops? 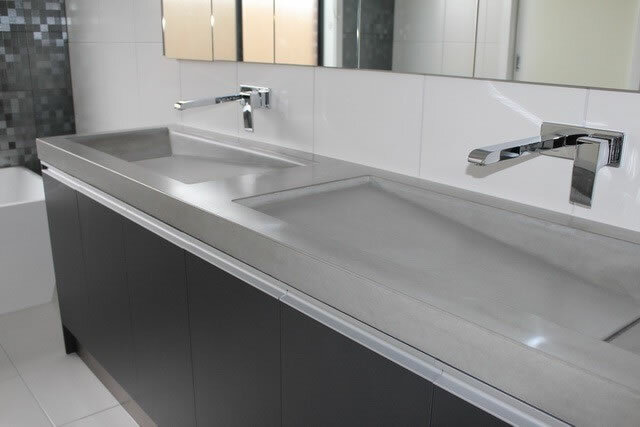 Future Concrete benchtops can accommodate all types of sinks including drop-in, undermount and apron front. The minimum lip of concrete around all sides of sinks is 75mm. Concrete can also accommodate drop-in cooktops. The minimum lip of concrete in the front of a cooktop is 75mm. We recommend 75mm for the back also, but 50mm will suffice. Future Concrete can make integral concrete sinks of almost any shape. Bathroom vanity tops are an excellent application of integral concrete sinks. We do not recommend integral concrete kitchen sinks for engineering reasons. Kitchen sinks are deep and have angles that would put large stresses on the concrete and have high potential for cracking. Also, the size of kitchen sinks generally dictates a very thick concrete bottom that would be a problem with standard plumbing and cabinetry. Concrete vessel sinks are also possible, and concrete’s versatility means that the sink can be any colour and shape. Splash backs are cast and finished separately and deck mounted after the benchtops are installed. Splash backs are nominally 25mm thick and can be from 75mm high to full height. Outlet openings are cast in, not cut on site. Bare concrete is very porous and will readily stain. Virtually all concrete kitchen benchtops are sealed to prevent staining; however the degree to which these sealers works varies significantly. Commonly used sealers include wax and penetrating acrylic sealer. Both of these are inexpensive and easy to apply. However, neither offer significant stain or heat resistance, and both require frequent reapplication to prevent the formation of a “patina”. Future Concrete’s sealer is different. We use a high-performance sealer that is exceptionally durable and provides excellent resistance to incidental contact with staining agents such as red wine, lemon juice and olive oil. Complete care instructions are included in your Owner’s Guide. Touch-up of any marks that do occur is simple and easy. While the sealer is durable, it can scratch if cut with a knife or subjected to heavy, sharp objects dragged across the surface. Cutting on the concrete may compromise the integrity of the sealer and allow stains to permeate the concrete matrix. Cutting on the concrete will also ruin knives, requiring a professional resharpening to reshape the damaged edge. Remember, concrete is made with stone, the same thing used to sharpen knives (and will therefore dull them just as easily). If you do scratch a countertop, you can easily repair it yourself using your Touch-Up Kit. Can I put hot pots on the benchtop? As with almost all types of benchtop surfaces, it is best to use trivets. Concrete can microcrack if exposed to high heat, and the sealer is not elastic enough to “absorb” these microcracks. The surface will appear “crazed”. However, the Touch-Up Kit can be used to minimize the appearance of these microcracks, just like it is used to touch up scratches. How are concrete benchtops made? When it comes to concrete benchtops, there are two basic processes: cast-in-place and precast. Cast-in-place involves building forms and pouring concrete in place, directly on the cabinets. While this avoids the hassles of transporting heavy slabs, it does tie up the site for many days (or weeks), and it involves a messy process. In addition, cast (or pour) in place provides fewer options and less control over the finished product. Generally the only finish available is a trowelled surface, which is either acid stained or colored with pigments. The quality of the concrete, the finished appearance and ultimate performance of the countertop are all hampered by the fact that it’s all being done on site under a rushed time schedule. Because of our education with The Concrete Countertop Institute, we are able to reinforce wet cast concrete properly to prevent cracking. 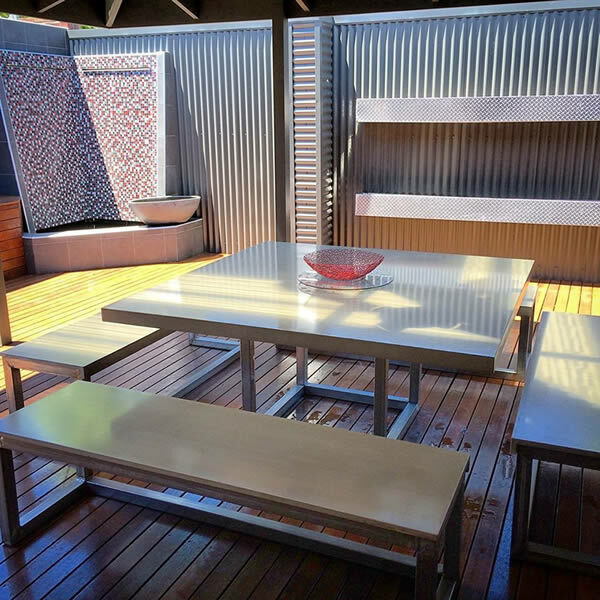 Proper steel reinforcement is essential to combat the large stresses placed on a long, thin slab of concrete such as a benchtop. Future Concrete will work with you to determine which type of concrete is best for your project, depending on the look and shape you want to achieve. Future Concrete often performs custom colour matching and submits samples for your approval. Allow about 3 weeks for this process. See the section on custom colours for more information. The typical time required to fabricate most concrete benchtops, depending on their size and complexity, is 3-4 weeks. Note that the fabrication process may not start immediately after templating depending on how full our production schedule is. A good guideline is to contact Future Concrete at the beginning of the project, or at the latest one month before cabinetry is scheduled to be installed, both to allow time for custom colour samples and to secure a spot on Future Concrete’s production schedule. In the case of a residential project such as a complete kitchen remodel, homeowners are usually willing to wait longer for their custom-made, handcrafted concrete benchtops. However, temporary benchtops can be a way to minimize inconvenience. Temporary plywood benchtops are one possible solution. Or, the contractor can preserve parts of the old benchtops to provide some work surfaces. Because Future Concrete benchtops are precast and prefinished, installation generally takes less than one day. Concrete benchtops are templated just like quartz and granite. Templating is done after any existing benchtops are removed, or after new cabinets are fully installed. Your contractor needs to arrange for existing benchtops’ removal. Almost all concrete benchtops require physical templates from the finished and installed cabinetry. How are the benchtops installed? 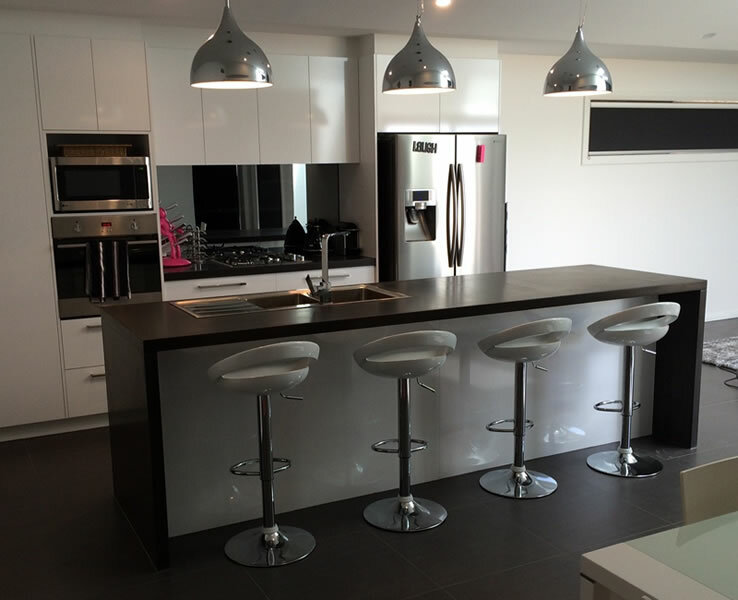 Concrete benchtops are handled and installed just like quartz and granite. Seams are caulked with a colour-matched acrylic caulk. Your contractor needs to arrange for plumbing and electrical hookup no earlier than 24 hours after the benchtop installation. Often concrete benchtops can be designed without seams. Seams may be located around sinks and cooktops, or wherever required for structural reasons. Or, seams may be necessary due to the logistics of getting the slabs into the house if stairs or corners are involved. Future Concrete will work with you to design seam placement that is both structurally sound and aesthetically pleasing. Seams are typically 1.5mm wide, similar to tile grout lines. 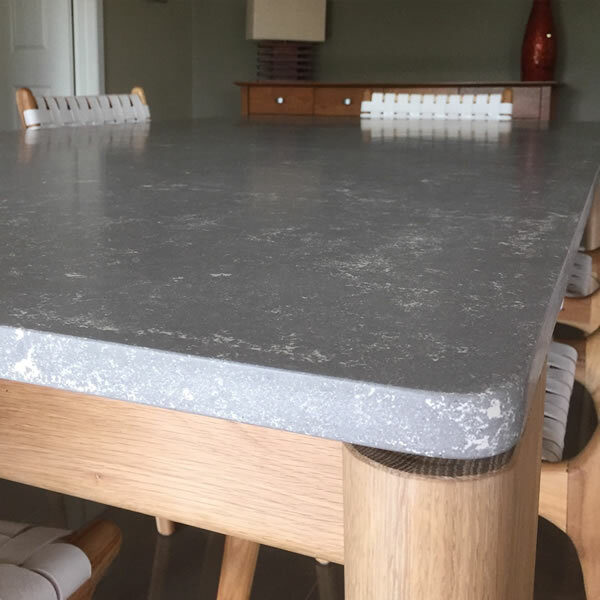 However, it is important to realize that concrete benchtops are hand made and hand processed; they are not machine cut, so tolerances for seams are more generous than with quartz or granite. Seam appearance is minimized by using colour-matched acrylic caulk. No. Standard precast concrete weighs about the same as quartz or granite of the same thickness and glass fibre reinforced concrete weighs half as much. Typically, no special considerations are necessary for standard kitchen or bathroom vanity tops. Cantilevered slabs, bartops on kneewalls and similar situations sometimes require brackets or other structural supports. Future Concrete can advise on support requirements. Yes. Future Concrete warrants the structural integrity of the concrete for one year after installation. Concrete will of course last a lot longer than a year, but if any problems were to occur, they would occur in the first year. We subject the concrete to much larger stresses while handling it than clients ever could once it is installed. In addition, Future Concrete provides each client with an Owner’s Guide and a direct phone number for support from Peter Bennett. Contact your designer or Peter Bennett. Peter Bennett’s home is open as a showroom by appointment only, and he is available nights and weekends as needed.